Living with A-Fib for Twenty Years! 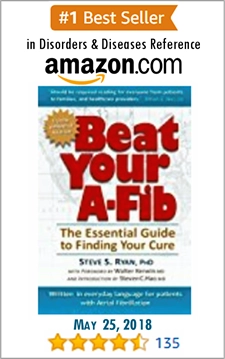 Former Professional Basketball Player Who Sells A-Fib Monitoring Devices Develops A-Fib. Stress and the Heart-Brain Connection. I was diagnosed with atrial fibrillation in the Autumn of 1993. I was 34 years old. Doctors told me that I had ‘Lone’ Atrial Fibrillation which meant that I had no structural disease or other risk factors. In other words, they couldn’t pinpoint why I had it. Neither could I. I didn’t drink or smoke at the time. I had pristine blood work and an other-worldly cholesterol level of 127. To top that, I was a former professional basketball player. The thought that this bodily temple could have any defect was beyond my comprehension. It happened one Saturday morning racing down the New Jersey Turnpike jacked up on 3 double expressos. Fearing I’d be late to pick up my daughter for the weekend, I felt a thump in my chest followed by a rapid fire series of beats that didn’t let up. Every few seconds I found myself breathing deliberately, sucking in as much oxygen as possible. I felt lightheaded. I pulled off the highway and took my pulse. It was irregular and 2 ½ times my normal heart rate. It was a surreal feeling to think that I was becoming a patient. Being in the business, I was very familiar with the A-Fib demographic and knew that I didn’t fit. I was embarrassed to talk about it and convinced that it was a fluke. I’d worn heart monitors several times in training or for demonstrations, and I’d never had an arrhythmia. I quit coffee and caffeine cold turkey. I took more supplements, improved my diet, and stepped up my workouts. I made every physical change that I could think of. I devoured anything I could find about Afib and queried cardiologists about their struggles to diagnose and manage the disease. The irony that my daytime hours were dominated by efforts to get cardiologists to buy monitoring equipment to detect and help their patients with ‘my problem’ was never lost on me. 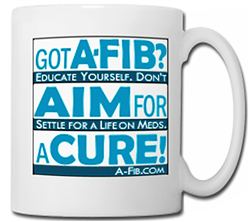 After living free of A-Fib for two years, it happened again. My life was complicated – I was in the midst of a divorce, plus I had two daughters from two mothers. I was traumatized by a fear of losing my first daughter to a distant state or a new father. 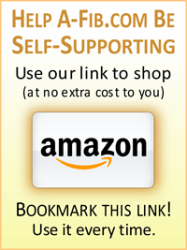 Both mothers felt that I could provide more financial help. Shame and guilt plagued me as I strove to fit the jigsaw puzzle of my evolving family into the cookie cutter portrait of parenting that I’d grown up with. There was also a lingering unease that lifestyle choices had led to this weakness in my heart. Memories of excessive partying in the ‘80s particularly the decadence during my time as a professional basketball player in Brazil haunted me. That A-Fib turned up only when I was under intense emotional stress led me to wonder if it might just be a symptom of a larger issue. The universal symbolism of a broken heart in art or literature allowed me to feel sorry for myself but also made me very curious. And I scoured the emerging literature on the Brain-Heart connection looking for answers. I treated A-Fib like it was a character flaw. Although I worked in healthcare, I had an aversion to seeing doctors or taking medication. My ego could not take the thought of me being a patient. Here I was in the cardiology business embarrassed to talk to my friends! For the first ten years, I stayed in denial about having a ‘condition’. I perceived a relationship between stress and A-Fib that convinced me that, if I balanced my behavior emotionally and physically, this ailment might just go away. One day while sheepishly describing my story to a doctor, he cut me off mid-sentence, “This isn’t your fault!” I looked at him and thought how can he be so sure? I made an ardent effort to employ positive thinking, visualization and meditation to find that balance. I routinely self-monitored and became a master of taking my pulse and correlating it to the recorded ECG printout. I started a diary and kept a record of every time I went into A-Fib. I tried all sorts of alternative means to shake it. After reading a book about ancient healing techniques, I twice jumped into an ice cold bath to rid myself (it worked just like a cardio-version). I tried taking doses of magnesium so high that I got diarrhea, but the A-Fib seemed to leave quicker. I tried acupuncture. I was open to any form of alternative hope –anything to avoid having to admit a crack in my image. I thought that I was going to heal myself and then teach the cardiology world how I did it. A friend labeled my attitude “New age arrogance”. The wake up call came in the early 2000’s when in short succession both of my parents were diagnosed with A-Fib. My dad became fond of joking, “We caught this from you.” He helped me to accept the reality, and I no longer felt so isolated. 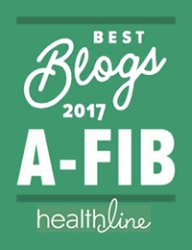 By then my A-Fib was occurring at least once a year, and I had begun to correlate triggers to physical causes like alcohol use or a lack of sleep. I started taking aspirin daily and went to see two renowned cardiologists. I was relieved when upon examination neither of them recommended a procedure. 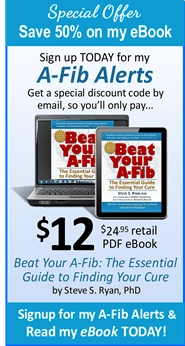 I began to approach A-Fib like it was an unwanted cousin. You know, the cousin who shows up unexpectedly and stays too long and whose behavior annoys you to no end. Like an unwanted cousin, A-Fib is a part of who I am. I let go of any sense of shame and stopped blaming myself, mostly. I realized that I’ve actually made a hell of a lot of good choices -that in fact, my lifestyle is rather tame, largely organic and benign. A cardiac electrophysiologist recently asked “Why not have an ablation and just end this?” Well, I admit I’m scared. And although I have been told that I’m a great candidate for cardiac ablation, I’m not yet ready. One recent morning that ‘cousin’ came knocking. There was no announcing its presence. It barged right in as if it owned the place. As I turned to climb a flight of stairs, my heart started knocking hard from the inside out, stealing my breath and causing me to grasp for the railing. When I first realize I’m in A-Fib, a brief wave of nausea overtakes me. A sinking feeling descends that takes some mental fortitude to push through. In the first decade with A-Fib, I’d cancel everything and stay in bed waiting for the cousin to leave me in peace. Now I push it out with medication and proactive perseverance. Each time it comes I wonder, will this be the time it doesn’t leave? Am I gambling with the risk of stroke? Is it time to consider a procedure? Two hours and 200mg of anti-arrhythmics later it was gone –the cousin vanishes down the street, my left fingers pressed to my right wrist counting for regularity, feeling for the beautiful, rhythmic simplicity I’ve come to cherish. My sense of relief borders on ecstasy. I once suffered A-Fib with horror, embarrassment and shame. Now I accept it without taking it personally, and I’m grateful for at least one side effect –the humility that came with finally embracing the condition. My new normal is minimal alcohol, daily aspirin and antiarrhythmics. The first lesson I learned in ‘94 was that I can’t ingest caffeine. Recently I’ve learned that alcohol is not my friend. One drink is okay, but one for several nights is not and certainly two requires an antiarrhythmic chaser. I know that when I am dehydrated, I am at risk, that when I don’t sleep, particularly when traveling cross country or overseas -watch out. I know that when I am in emotional distress, my risk increases. I know to take my meds on time and I’m proactive; I take a higher dose of anti-arrhythmic when at greater risk. It has been demonstrated that A-Fib is a progressive disease. And though I am still proud of avoiding surgery for 20 years, I am realistic about how long this approach might hold. The antiarrhythmic that I now take daily has all but eliminated episodes of A-Fib, and I seem to tolerate the drug well. But I’m wise to expect to hear that asynchronous, unexpected knock a couple times a year. The cousin is less a reminder of fear today than of the uncomfortable reality. When I’m on my game, I keep its visit to a couple of hours. And at all times I find solace, gratitude and even inspiration in the contrast between this chaotic beating cousin and the wonderful rhythm of normal life. The Cardiologists Jon talked with didn’t recommend he get a catheter ablation, because his A-Fib episodes were infrequent (once a year) and relatively short (around two hours). And though A-Fib is a progressive disease that tends to get worse over time, Jon’s doesn’t seem to be progressing and seems to be under control probably because of the antiarrhythmic drugs he takes. Though today’s antiarrhythmic meds often can have bad side effects, Jon tolerates his well. And current anticoagulant guidelines wouldn’t recommend that Jon take heavy-duty anticoagulants like Coumadin. But when Jon does have an A-Fib attack, it can be very debilitating. 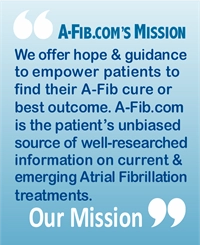 Jon could certainly opt for a catheter ablation to make him A-Fib free if he so wished. But he would have to be very assertive with his Electrophysiologist (EP). Catheter Ablation is considered a low risk procedure, but there is still some risk. EPs might be hesitant about doing a catheter ablation in Jon’s case.